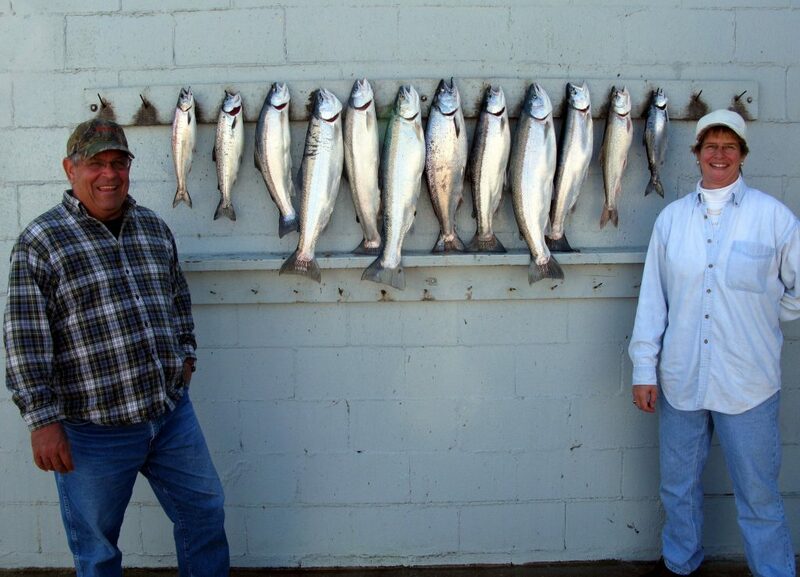 Our 2012 fishing season has ended and we are currently accepting bookings for the 2013 season. A big Thank You to all our fishing friends who helped make our season a success. See you next spring. Fished the same area today that we fished Sunday & Monday. The huge schools of bait we had been marking were gone. We marked a few small pods of suspended bait, but nothing like yesterday. We were marking fish in the 60 to 90 foot range. The morning started out slow, but the action picked up the last couple hours of the trip. We trolled east and west in the 54’s & 55’s from the 35’s to the 40’s. Our top rod was a Dreamweaver Beefeater 150 out on a low wire diver. It went four times. The other low wire out 140 went twice with a Fuzzy Bear Blue Educator. Our best coppers were our 300’s with a DW Beefeater & a Yeck Wart Frog. Top rigger was an out down with a pair of Yeck Wart Frogs down 65 feet. 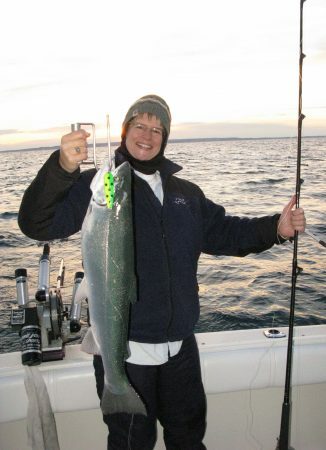 A regular size DW Green Dolphin took fish 75 down on the chute rigger and on a 250 copper. Today was our last scheduled trip for the 2012 season. The boat will be in the water for another week or two, so if you would like to try some October fishing give us a call at 877 456-3474.